Pentair Technical Products introduces the Hoffman™ Solar Combiner Box, designed to meet the challenges of solar energy applications. Pentair Technical Products introduces the Hoffman™ Solar Combiner Box, designed to meet the challenges of solar energy applications. 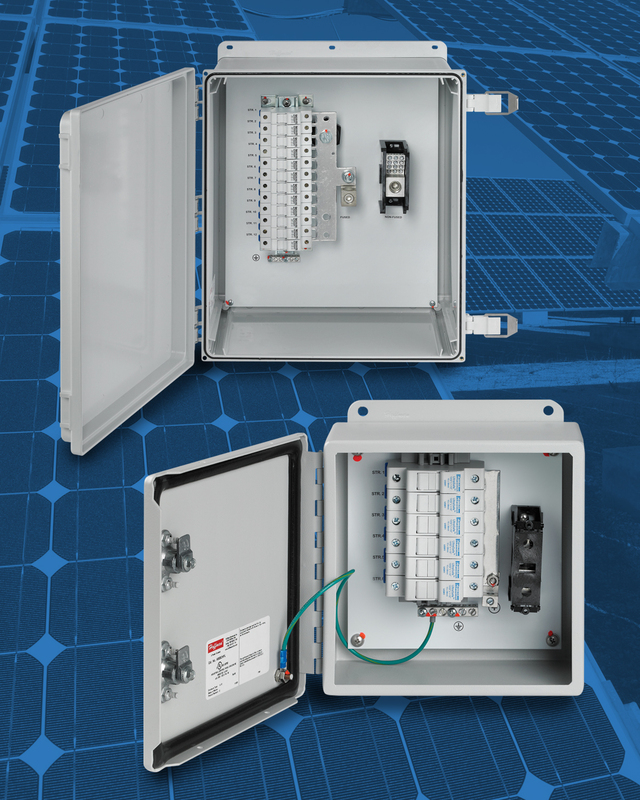 The combiner box provides a simple solution for combining electrical inputs for photovoltaic applications into a single output, while offering robust protection against harsh environmental conditions and sufficient flexibility to keep pace with emerging demands. The Hoffman Solar Combiner Box is available in POLYPRO™ and 14-gauge mild steel models. Non-metallic POLYPRO material is non-glass-filled polyester that offers a superior and cost-effective combination of corrosion, impact, chemical and UV resistance, and protects against wind and moisture. POLYPRO boxes provide an overlapping tongue-and-groove raised cover and gasket for a secure seal and are Type 4X rated. Mild steel models offer a cost-effective option with continuous hinges, oil-resistant gaskets and a Type 4 rating. Both versions are available in 6- and 12-string configurations and can accommodate a wide range of solar panel applications. Combiner boxes include touch-safe fuse holders, with a non-load break rating to 30 amps max for quick and easy changes. Mounting panels with silk-screened labeling facilitate simple mounting and reference. They can also be used with C11000 alloy copper, electroplated busbars for efficient power distribution. Pentair Technical Products, a Pentair global business unit, is a leading provider of worldwide product and service solutions for enclosing, protecting and cooling electrical and electronic systems. Its industry-leading brands—Hoffman™, Shcroff™ and McLean™ Cooling Technology—provide a broad variety of standard, modified and engineered solutions to the commercial, communications, energy, general electronics, industrial, infrastructure, medical, and security and defense markets. Pentair (http://www.pentair.com) is a global diversified industrial company headquartered in Minneapolis, Minnesota. Its Water Group is a global leader in providing innovative products and systems used worldwide in the movement, treatment, storage and enjoyment of water. Pentair’s Technical Products Group is a leader in global enclosures and thermal management markets, designing and manufacturing thermal management products and standard, modified, and custom enclosures that protect sensitive electronics and the people that use them. With 2012 revenues of $3.0 billion, Pentair employs over 15,000 people worldwide.